A view from 1865 or 1866, looking north along Princes Street and showing the Gillies & Street Building on the corner. The two-storey building adjoining it was the Glasgow Pie House. Image: Toitū / Otago Settlers Museum 26-6-1. 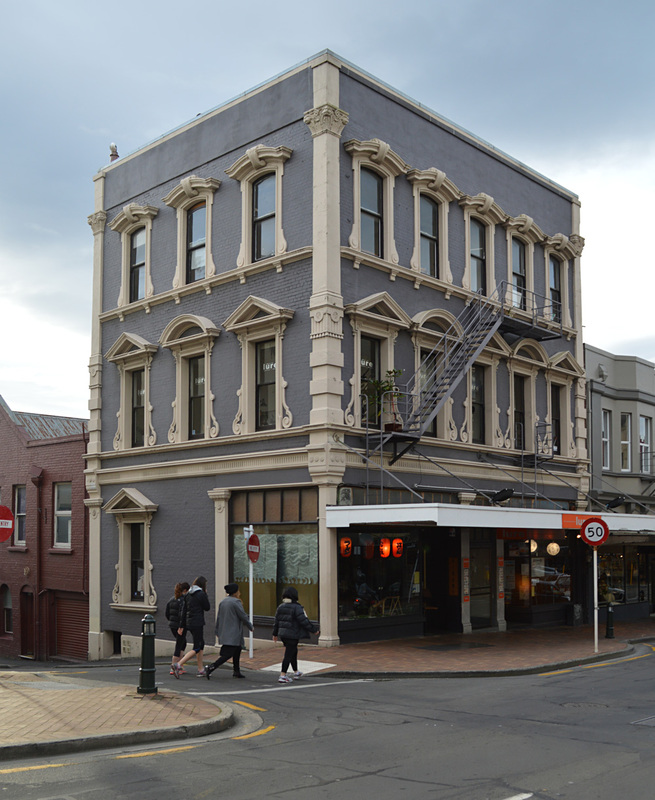 This building, originally owned by land agents Gillies & Street, made a bold and vivacious addition to Dunedin’s architecture on its completion in 1865. 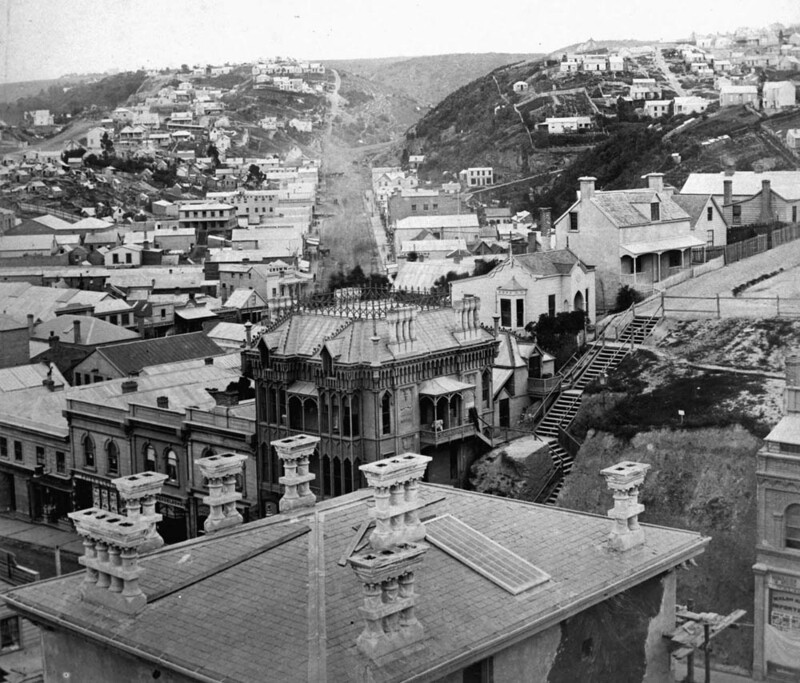 It was built two years after the discovery of gold at Gabriels Gully, when new-found wealth from the gold rush was rapidly changing the face of Dunedin. Modest timber structures were making way for brick ones of more substance and pretention, including this, the city’s first corner office block, with its vigorous Florentine styling and rich ornamentation. Still in his twenties, Robert Gillies had arrived in Otago as a teenager in 1852. His father had been Town Clerk of Rothesay in Scotland, and in Otago became a prominent landowner and member of the first Provincial Council. 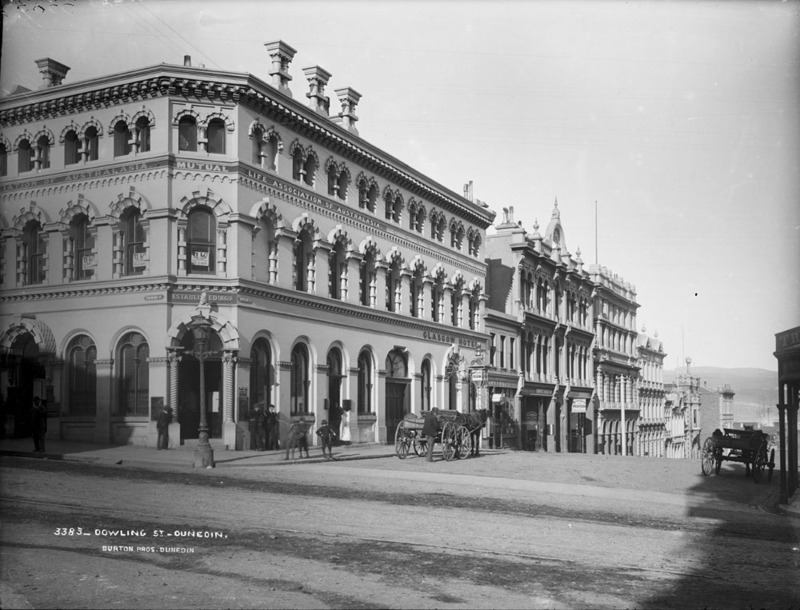 In 1861 Gillies went into partnership with Charles Henry Street, who had come to Dunedin from England in 1853. Tenders for construction of the brick and stone building were called in September 1864, and it was complete by March 1865. In addition to the owners’ offices were upstairs rooms taken by the law firm Howorth, Barton, and Howorth. An 1865 view showing the roof of the uncompleted building in the foreground. Behind it is the Oriental Hotel, with Maclaggan Street running into the distance. Image: Alexander Turnbull Library PAColl-3824-04. Mason & Clayton were the architects. I can’t be sure which partner was primarily responsible, but the building appears to be more in the style of William Mason, who had designed another richly decorated edifice for Gillies a few years before. The Revived Renaissance design had some delightfully imaginative decorative elements: a statue of a rather humanesque lion sat over the corner doorway, and there may have been another above the Princes Street entrance. Herbert Webb, a staff member in the law firm, said that the partner George Barton was teased because of his likeness to the lion, and so had the statue removed! Even more remarkable was the cornice, on which dogs’ heads (about 60 in total) looked out above each of the brackets. I like to think that Charles Street may have had some hand in these quirky features. Street was the ‘dear good nephew’ of Edward Lear, the famous author of The Owl and the Pussycat and other nonsense verse. It’s also possible Gillies requested them, or that the architect was bold enough to suggest them himself. Other decoration included barley twist pillars, Corinthian capitals, rusticated arched lintels, and impressive chimneys which echoed those of the Oriental Hotel on the street corner diagonally opposite. Most of the decorative columns on the building were curiously punctuated with rectangular blocks. 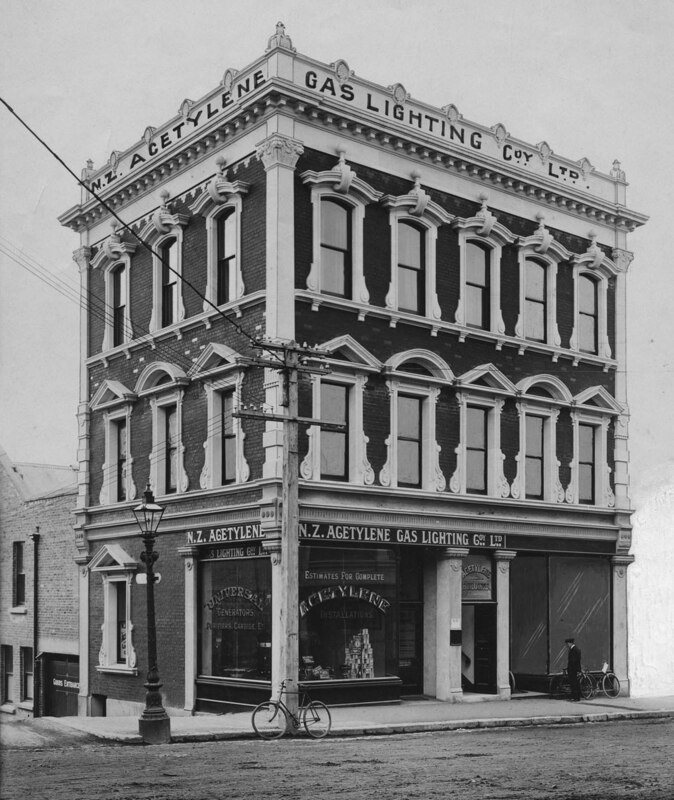 A photograph from 1885 or 1886 showing the building after the additions were made. Lettering on the lamp at the hotel entrance reads ‘Donaldson’s Shades’. Above a separate door to the left are the words ‘Glasgow Pie House’. Image: Burton Bros. Museum of New Zealand Te Papa Tongarewa C.011730. 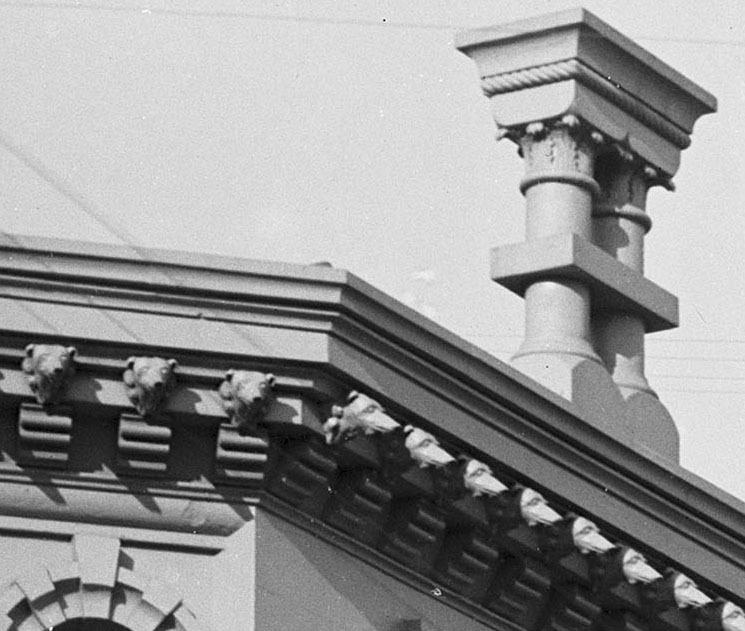 Detail of cornice and chimney. Image: Burton Bros. Museum of New Zealand Te Papa Tongarewa C.011730. Detail of corner entrance, including the humanesque lion. Pointing hands have been added to the lamp post. Image: Burton Bros. Museum of New Zealand Te Papa Tongarewa C.011730. It was likely from this building that Herbert Webb observed a lawyer’s client being lowered into the back yard with a rope, in order to escape a bailiff waiting in the outer office. Barton owed large damages following a court case in 1866, and the legend in his office (probably apocryphal) was that he avoided arrest by hiding in a beer barrel that was taken on board a departing ship. In 1868 Henry Howorth went into partnership with W.M. Hodgkins (best remembered today as a painter and the father of Frances Hodgkins), an arrangement which continued to 1884. Gillies & Street flourished, and in 1875 they moved to new premises in Bond Street. 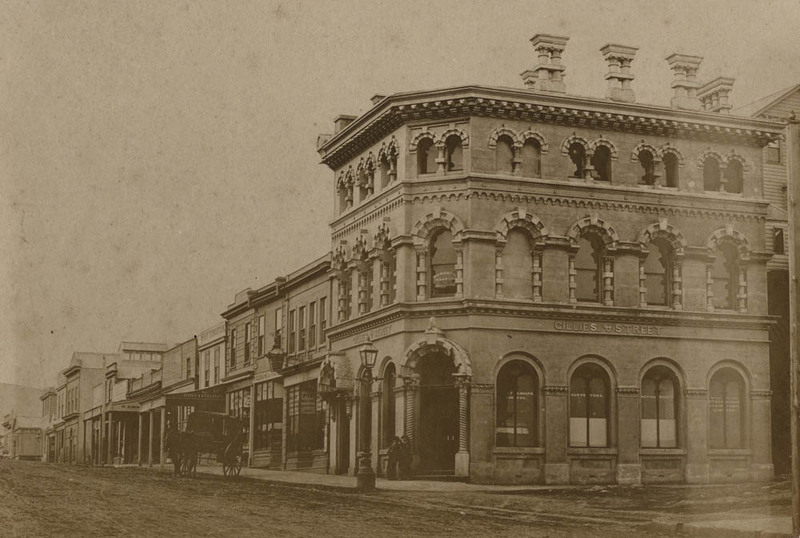 In 1880 a large building was built for them at the corner of Vogel and Rattray streets, adjoining the Terminus Hotel. By that time they were Gillies, Street & Hislop, and in 1884 the firm expanded to form Perpetual Trustees, which is still in operation today. In 1875 John Donaldson, who owned the adjoining Glasgow Pie House in Princes Street, bought the Gillies & Street building. Additions in 1875 and 1877 (the latter designed by R.A. Lawson) doubled the length of street facades along both Princes and Dowling streets, and replicated the original ornamentation. The new Glasgow Hotel offered thirteen bedrooms, a restaurant and bar, and specialised in catering for large banquets (including some held by William Larnach in the Bank of New Zealand building). Donaldson loved making wedding cakes and one of his daughters recalled one so large it took three men to carry it. In 1877 the first English cricket team to tour Australia and New Zealand stayed in the hotel. 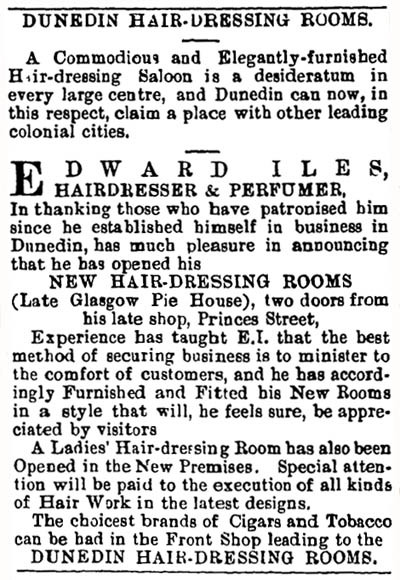 Advertisement from Otago Daily Times, 30 December 1884 p.3. Image: Papers Past, National Library of New Zealand. In 1884 Donaldson sold the buildings to the Mutual Life Association of Australasia for £13,500. They opened offices at the corner and prominently displayed their name on the facades. 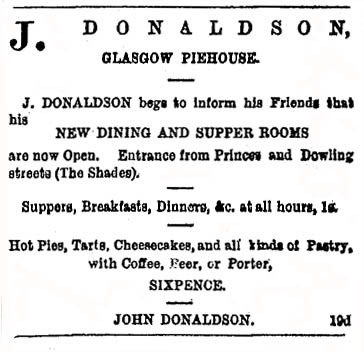 Donaldson continued to run the hotel business in the Dowling Street portion and by the end of the year had opened new dining and supper rooms for the Pie House and what he named ‘The Shades’ (this shared its entrance with the hotel, while the Pie House had its own entrance). The names Glasgow Hotel and The Shades were used (seemingly interchangeably) for some time after that date, but the Pie House closed not long afterwards. From 1896 the pub was known only as the Shades Hotel. In 1887 Donaldson left to build the Excelsior Hotel on the site of the old Oriental. The Shades continued to operate until it lost its licence in 1903. It then reopened as a dry establishment, known as the Carlton Private Hotel and Dining Rooms up to 1913, and then as Jackson’s Private Hotel. The hotel closed in 1922 but restaurants operated in the second floor space until about 1950, when Lake’s Restaurant closed. Someone (identified only as ‘D.M.R.’) who recalled the restaurant in its Edwardian days said that for sixpence there were three-course meals of soup, several meats, and trimmings, sweets, and as much tea as one wanted. Upstairs, for an extra threepence, the tables were decorated with flowers, and there were cruets and tomato sauce. The fare was enhanced by a ‘dollop of cream on the pud’, and the addition of an ample supply of fruit cake, scones, and jam. 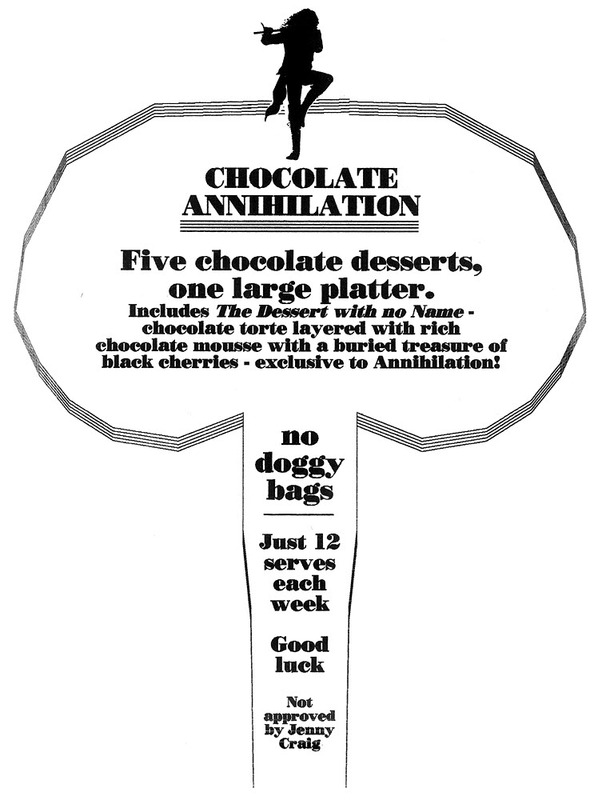 Advertisement from New Zealand Tablet, 27 August 1886 p.12. Image: Papers Past, National Library of New Zealand. The Mutual Life Association left in 1912, after 28 years in the building. 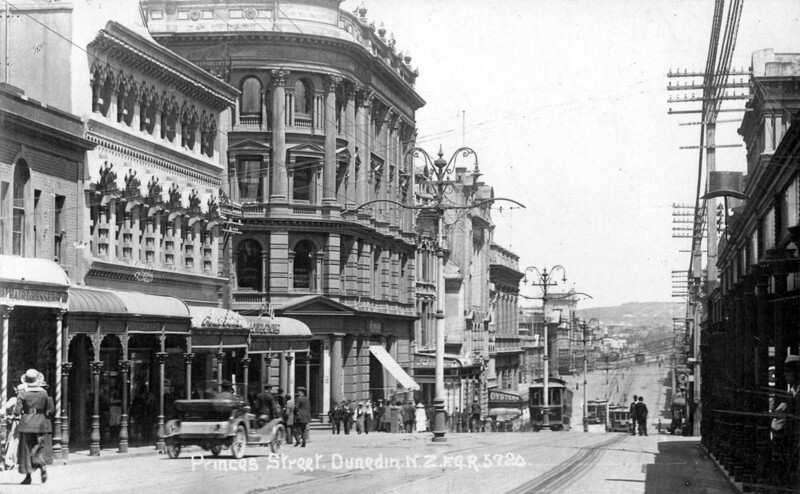 Verandahs and new shop fronts were built along the Princes Street frontage in the early twentieth century. The hairdresser Edward Iles took the old Pie House shop in Princes Street as his salon and tobacconists from 1886 to 1912. The tailors T. Young & Co. had rooms on the first floor for forty years from 1915 to 1955. Two sisters, Annie and Mary McIntyre, ran a cake shop at the corner between 1915 and 1938. This became a hardware shop in the 1940s, and was named Hardware Corner Ltd in 1953. The Commercial Bank of Australia was a ground floor tenant on Dowling Street from 1922 onwards, and stayed there until the demolition of the building, afterwards taking space in its replacement. Clubs, lawyers, real estate agents, commission agents, dressmakers, engineers, architects, and an elocution teacher, were among the many others who had upstairs rooms, and after the hotel closed there was a live-in caretaker. A view looking south down Princes Street, taken some time between 1913 and 1919. By this time verandahs and new shop fronts have been added. Image courtesy of Dave McLaren. 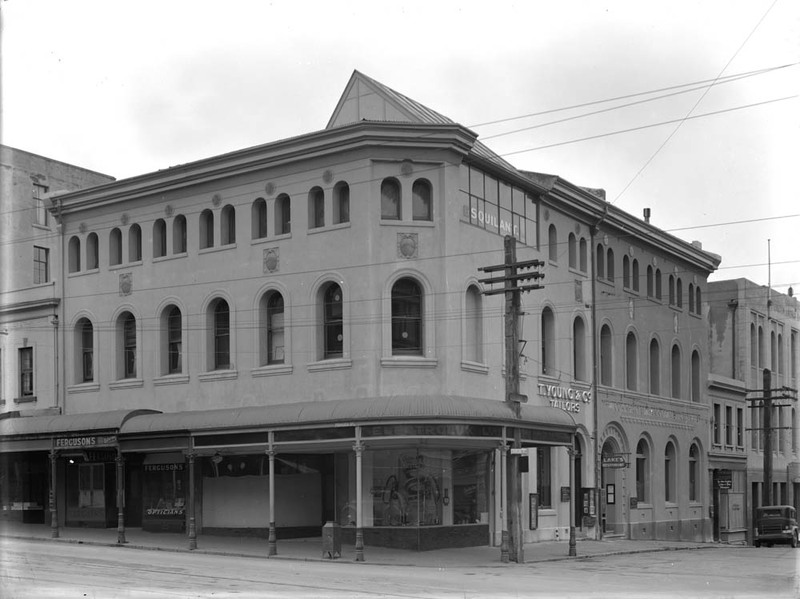 The building as it appeared in the early 1940s. Shops are occupied by Ferguson’s Opticians and Electrolux Ltd. On Dowling Street is signage for Lake’s Restaurant and T. Young & Co. tailors. The photography studio on the top floor has generous glazing with the name ‘Esquilant’ prominently displayed. The Commercial Bank of Australia has signage in relief lettering. The small building at the right included Ye Olde English Cake and Tea Shoppe and the office of the architect E.W. 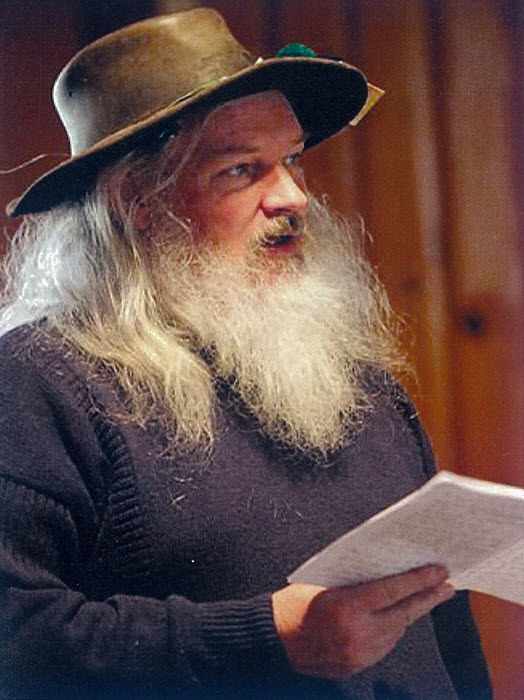 Walden. Image: Hocken Collections S08-035b. William Esquilant’s photography studio opened on the top floor in 1913, and new glazing was put in for him. Esquilant was a keen pigeon fancier, but I don’t know if he made use of his professional rooms for his homing pigeons. In 1945 the studio was taken over by Franz Barta, a Hungarian émigré who had left Europe in 1938 to escape Nazi persecution. He remained there to 1968. In 1940 architects Miller & White designed a revised facade for owner Kate Thompson. The original decoration was removed but the familiar fenestration patterns remained. 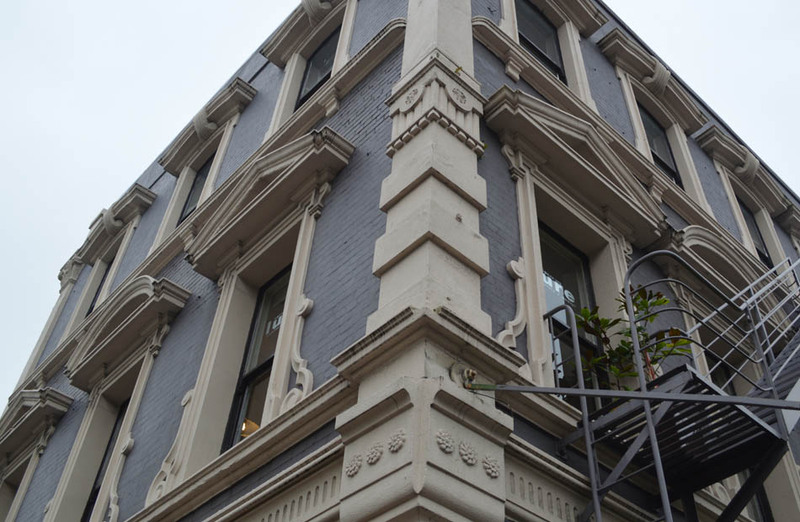 The contractors Knox Bros carried out the work, which when finished gave the exterior a simple plastered finish with understated decoration that was fashionable at the time. It gave the building something of a Spanish look. The Otago Foundation Trust Board had the building demolished in 1968 to make way for their Cargill House office block, which was designed by Ian Dunn of the architecture firm Miller, White & Dunn. That building was completed in 1970 and housed the Inland Revenue Department for many years. In 2004 it became the Scenic Circle Hotel (now Scenic Hotel Dunedin City), which gives some sense of continuity with the days of the Shades. 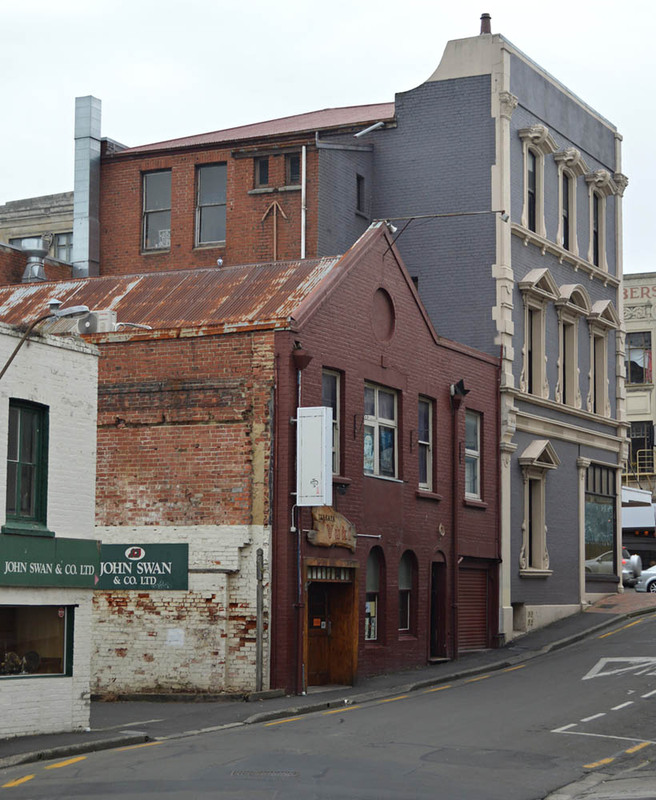 Newspaper references: Otago Daily Times, 20 September 1864 p.6 (call for tenders), 13 March 1865 p.3 (Howorth, Barton & Howorth), 18 April 1865 p.9 (fully occupied, architects named); 13 October 1875 p.2 (additions and sale of building), 15 October 1875 p.2 (sale of building), 27 October 1875 p.2 (additions), 3 March 1877 p.2 (English cricketers in residence), 9 August 1877 p.4 (additions designed by R.A. Lawson), 11 October 1884 p.2 (purchased by Mutual Life Association), 1 December 1884 p.4 (sale of furniture etc. ), 2 October 1893 p.3 (advertisement for The Shades Hotel), 12 November 1896 p.5 (Glasgow Hotel, also known as Shades); Illustrated New Zealand Herald, 1 July 1868 p.6 and supp. (description and illustration); Evening Star, 22 June 1968 (‘Do you remember the Shades Hotel?’), 29 June 1968 (letter to editor), 1 July 1968 (letter to editor), 13 August 1968 (‘They remember Shades Hotel in this city’). Other references: Stone’s Otago and Southland Directory; Wise’s New Zealand Post Office Directory; telephone directories; Herbert Webb, ‘The legal profession in Dunedin in “the sixties” of last century and somewhat later’ (Hocken Collections, Misc-MS-1283); Dalziel Architects records (Hocken Collections, ARC-0520). 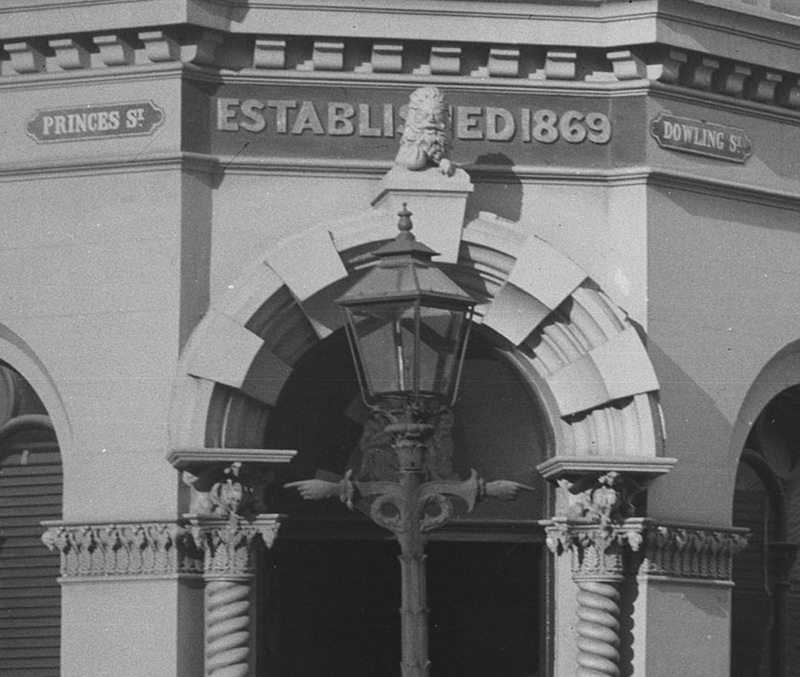 This entry was posted in Buildings and tagged 1860s, Cake shops, Dowling Street, Facelifts, Hairdressers, Hardware, Hotels, Lawyers, Lost Dunedin, Mason & Clayton, Photography studios, Princes Street, R.A. Lawson, Renaissance revival, Restaurants, Victorian, W.H. Clayton, William Mason on 15 July 2013 by David Murray.